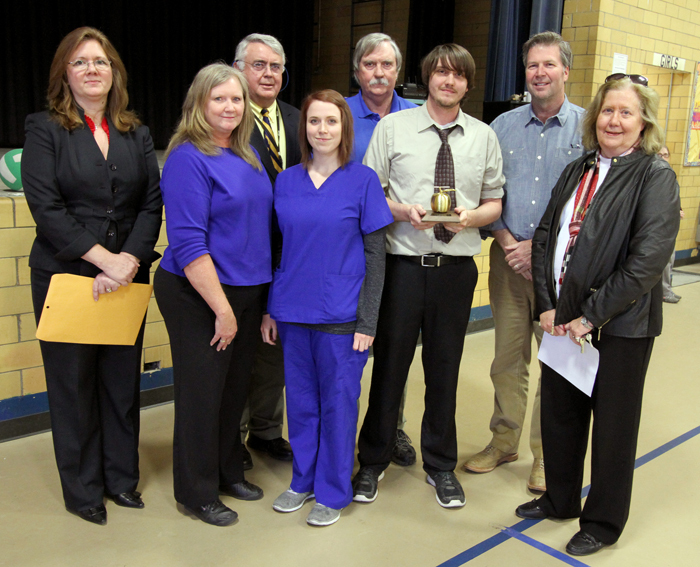 QUITMAN - Teaching might run in the family for the December Golden Apple Award Teacher of the Month but Daniel Gilmer has found his own unique way to bring to life his fascination with literary classics. The eighth grade English teacher at Quitman Junior High School brings a passion to the subject so great that he can easily transverse areas of literature reading with grammar and writing exercises, seamlessly during a 96-minute class block. Gilmer's ability to flow from one to the other amazes both his fellow teachers and his principal, John James. "Daniel is able to teach two classes of English simultaneously though a polycom," James said. "One half is reading and the other half deals with grammar and writing. It's amazing." Gilmer, 28, is in his sixth year as a teacher at Quitman Junior High School and he is joined on the faculty by his father, Richard, who is a sixth grade Social Studies teacher and his mom, Carol, a teacher's assistant. Gilmer was surprised when it was announced during an assembly at the school last week that he had been selected as the Teacher of the Month. "Excited, almost can't put it into words," Gilmer said. "Actually, I thought it might be for my dad, so I didn't expect it either." Gilmer was awarded by the Golden Apple Partners in Education $1,000 in school supplies, a $500 tuition voucher, and $300 in cash. 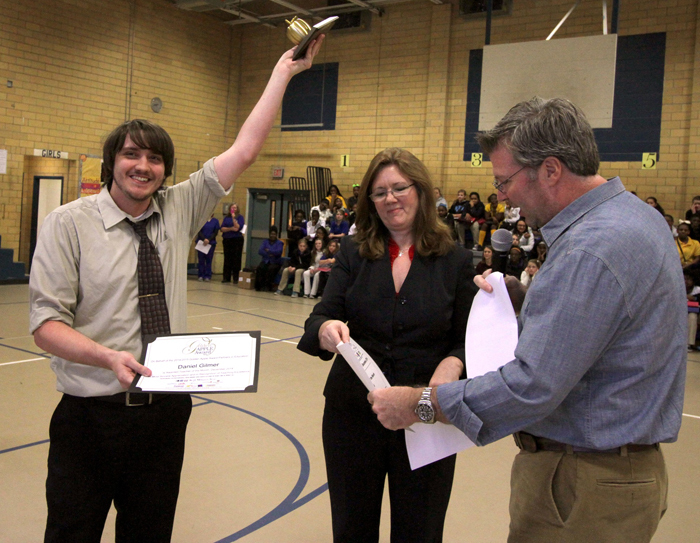 Gilmer is also in the running for the teacher of the year award which will be announced on May 28. The winner will receive a $2,500 prize and a $2,500 scholarship for a graduating senior of the winning teacher's choice. One of the biggest influences in Gilmer's life came while in junior college. There he was jolted by the instruction of English professor Alexus Lee.